- single connector with white cable on drivers side. Can't do phone call as have no phone reception neat car at all. I was looking in my documents for the information you requested, but I do not have it. I will proceed to release the query so that another expert can assist you. Set your meter to DC Volts, low range (if multiple ranges). Ground one lead to the battery negative post. Locate the fuel pump test connector, the single wire connector taped up on the firewall. If there is more than one test connector there, it is the one with the black/white stripe wire. Place the other meter lead in this connector, then crank the engine. Do you see battery voltage on your test meter while cranking. How many terminals have voltage? 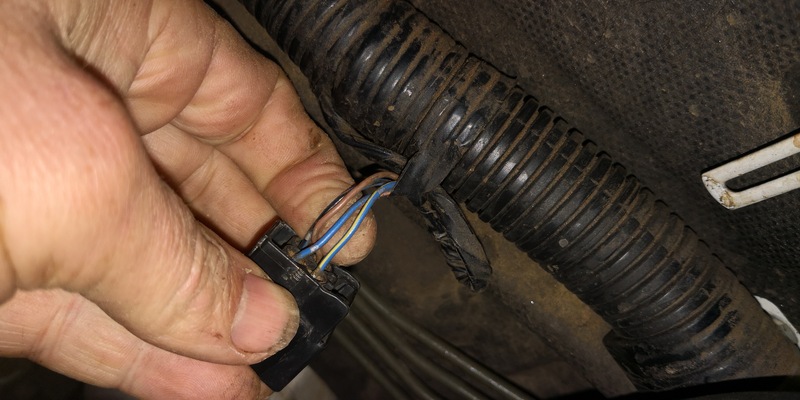 3.-Now connect your leads between coil 12V and the red/white wire, then measure the voltage while cranking. 4.-Thanks. So you are seeing a ground signal from the PCM it sounds like. Connect one meter lead to a good chassis ground. Crank the engine and monitor the reading.... do you have 12V? ok . with comes or not. but we have four wire we can chek each one if we have voltag or omhms. this is fire wire. not aways we can see a white wire. Hello dear customer, i am Jose Sebastian and i want to help you with your query. Dear customer, i would like to know what exactly problem do you have? and what and do you want to check? i did not understand pretty well your query and what the previus experts did they tell you. I just need to test power to the fuel pump. So which wire is the test connector? I apologize for the delay, i am currently on a trip. the pump connector you need to check how many wires it has, and put a tester or multimeter, and turn the key, one cable must have 12V another 5V and the others are masses, if the connector is two wires there are only 12V and masses. You should test one cable at a time.